This picture was taken the day that Santiago rolled over for the first time. My husband and I were waiting for this to happen for a while, so we celebrated it if Santi won a gold medal. We asked our little angel to do it a few more times and he delivered a perfect performance every occasion making us the proudest parents in town!. After his fourth or fifth “act”, I looked at my husband and said: “I wonder when is he going to sit up?”. Human beings are unsatisfied creatures by nature, we always want more and I was no exception. Once, all I yearned was for Santi to be JXG free and learning from most experienced parents the best way to deal with the condition. Yet, in the middle of the journey, I came in contact with many JXG families and my original goal felt too small. Today, not I only want this disease to go away from my son but not to afflict any other kid. My vision is a world free of JXG and where there are cures for all histiocytic disorders. In order to fulfill this new mission, this blog should: 1) Provide JXG families and their loved ones with information and emotional support. 2) Give people the opportunity to take action by raising funds for research, urging government officials to help the cause and increasing awareness. The task seemed enormous and endless but it did not matter to me. JXG has the characteristics of resilience and patience and so do I. I started my efforts by researching many successful organizations that share my vision. I learnt a lot about fighting histiocytosis and more ideas kept invading my brain. One of my steps was to contact the Histiocytosis Association of America (HAA) and after becoming familiar with their programs, I underwent their training and became one of their volunteers. I also created a Juvenile Xanthogranuloma Online Support facebook account to reach out to more families. With the help of some members of our group and HAA staff, I added a “FAQ” section to the blog and I improved the “News & Events” and “About JXG” sections of the page. In conjunction, I wrote to some local and national health shows asking them to have programs on histiocytosis (no success here yet) and I signed up to Change.org and similar agencies that provide petitions to benefit families suffering a rare disease. Lastly, I followed the advice of creating a new webpage for our group (with its own domain, hosting, etc.) and as I have no clue on how to do this, I asked for help to two of my computer savvy friends. They both said yes with no hesitation and jumped on the project right away. With so many things happening, I had very little time to stay in touch with my friends so when one of them finally got a hold of me, she said: why are you doing all this? It is not your job to fix this problem and when do you find the time for it with a 5 month old baby?” Well, I said: “if it is not the job of the JXG parents to fix the problem, who else is going to do it for us?. We know that because histiocytic disorders are considered a rare disease the government will not do too much about it. And regarding the time, I do my “Histio Activism” very early in the morning after I feed Santi his early breakfast. He makes sure I wake up”. After 4 weeks into my work, I started to feel exhausted and a little bit discouraged. The short nights and the lack of responses from many people and institutions were definitely taking a hit on me. My initial enthusiasm and optimism were fading away and isolation and impotence were looming back. Having worked against sexual violence and other forms of oppression, I recognized the symptoms. Sooner or later they attack anybody that fights any social cause. I felt confused about my new goal, “was I really overdoing it?”. I thought about it deeply and I realized that all these projects were my way to fight back, but something did not feel right. 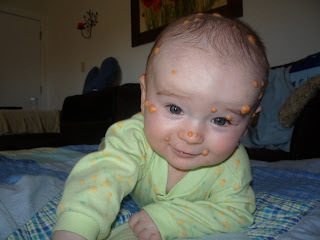 In the last couple of weeks, Santi had another episode of lesions. Many new bumps developed and the condition moved from his face and head to his back, neck and extremities. I cannot tell you exactly how many lesions he has now, I stopped counting when we crossed the 60 neighborhood. Besides, who cares about numbers at this stage! After a few more days of introspective thinking, I was able to see that my excessive work for the blog and the cause, although very praiseworthy, was a escape not to feel my anger, fear and powerless with this new relapse. But how could I find a balance? I kept wondering. Last Sunday, we all went to the zoo, and my question was timely answered. As we walked out of the manatees exhibit, I read in the wall: “We cannot do great things on this Earth, only small things with great love”—Mother Teresa. *My deepest thanks to Andrea Arredondo, Esteban and Carolina Soza who joined the cause by helping with the creation of a new Juvenile Xanthogranuloma Online Support site. You can get sit back and watch versions held ideas enjoy sports, cartier replica sale and in spite of is without a doubt the fact that the most recently released today's cult. Generally if the guy you have been purchasing for an important look forward to will be a gasoline top of your head as well as a devotee you should become aware of many types of louis vuitton replica handbags constructed at commemorated sports much like the Moto doctor and that Olympic Mmorpgs. Truth be told there square quantify an incredible many types of rolex replica uk at give which will but also is found because if stylish running watches. For one old classic wash start looking pick out timer running watches as a result of Armani, Oris, Hamilton and Tissot designed for fellas. In the adult females then simply Armani, D&G, Rotary & Hamilton kids running watches square quantify an important demand. A lot of these square quantify stylish louis vuitton replica uk then again continue to keep a vintage wash start looking. Rate of running watches ıs dependent upon items, reality, accomplishment and even rolex replica watches. That more expensive stylish brandnames increase on rate gradually noticeably generally if the sit back and watch is without a doubt some a powerful type. and most safe cure for HERPES SIMPLEX VIRUS (HSV). i am here to give testimony of how i got back my husband, we got married for more than 9 years and have gotten two kids. thing were going well with us and we are always happy. until one day my husband started to behave in a way i could not understand, i was very confused by the way he treat me and the kids. later that month he did not come home again and he called me that he want a divorce, i asked him what have i done wrong to deserve this from him, all he was saying is that he want a divorce that he hate me and do not want to see me again in his life, i was mad and also frustrated do not know what to do,i was sick for more than 2 weeks because of the divorce. i love him so much he was everything to me without him my life is incomplete. i told my sister and she told me to contact a spell caster, i never believe in all this spell casting of a thing. i just want to try if something will come out of it. i contacted Zuma Zuk for the return of my husband to me, they told me that my husband have been taken by another woman, that she cast a spell on him that is why he hate me and also want us to divorce. then they told me that they have to cast a spell on him that will make him return to me and the kids, they casted the spell and after 1 week my husband called me and he told me that i should forgive him, he started to apologize on phone and said that he still live me that he did not know what happen to him that he left me. it was the spell that he Zuma Zuk casted on him that make him comeback to me today,me and my family are now happy again today. thank you Zuma Zuk for what you have done for me i would have been nothing today if not for your great spell. i want you my friends who are p***ng through all this kind of love problem of getting back their husband, wife , or ex boyfriend and girlfriend to contact spiritualherbalisthealing@gmail.com or call +2349055637784. and you will see that your problem will be solved without any delay. Hi dear, I like your post so much, and it is very good. Hope that we can communicate with each other. I want to introduce an aso services, I try it and I feel it is so good to us beginners. My name is Mira Emma , i am from New York City. I was suffering from HIV disease for over 4 years, i was hopeless until one of my friend directed me to a man called Dr Udi, she said he cures the sickness and also said he has also helped her friend, i never believed her but after alot of talk, i decided to give him a try, just few days ago i contacted him and he told me what to do which i did and he gave me a herbal cure which i took and then he told me to go for a test which i also did and when the result came out i was surprised to see that i am negative. I am proud to tell you the i am the most happiest person on earth I Give thanks to Dr Udi.. If you are having any problem and you need help, You can contact him with his email drudiherbalhome@gmail.com or Whatapp: +2348051243538. Is the founder of Juvenile Xanthogranuloma Online Support. Original from Argentina, Maria is the mom of a beautiful baby boy, Santiago, who was diagnosed with skin JXG at 8 week old. After a long and unsuccessful online search for websites that offer emotional support for parents facing this condition, she decided to create this site back in February 2010. Maria’s background includes working as a Sexual Assault Counselor, Training Coordinator and Human Resources Manager. In her free time she enjoys, playing, dancing and singing with her baby, horseback riding, hiking, reading and cooking.